Looking for the best portable BBQ? When the sun’s out and the mercury reaches a scorching 20 degrees or more, there’s no better way to make use out of outside space. Whether it’s in your back garden, or on the beach if you’re lucky enough to live close to it, a barbecue is the best way to make the most out of the sunny weather, and you can always be prepared for it with a portable BBQ. Find more of our top picks in our best barbecues buyer's guide, or for tips on how to BBQ right, learn from us. Find more garden advice and product recommendations on our garden hub page. WHAT IS THE BEST PORTABLE BBQ? Taking our top spot as the best portable BBQ you can buy is the Weber Smokey Joe Premium Barbecue. This traditional kettle barbecue is a great all-rounder in terms of size, price, features and the fact it can easily be folded away. Scroll to read our full review. Portable BBQs come in all shapes and sizes. Some, like the Weber Smokey Joe Premium Barbecue are traditionally kettle-like in shape and are usually lightweight for easy transportation. Alternatively, portable BBQs can be even more compact, with the Berghoff Tabletop BBQ being a fantastic choice for social occasions. When you’re looking for the best portable BBQ for you, consider whether you would prefer to cook on gas or charcoal (both have their positives and negatives). Also consider the weight of the BBQ – you will be wanting to take it places after all. Large enough to cook effectively on charcoal, yet small enough to conveniently pack into the boot of the car, the Weber Smokey Joe is a great all-rounder that also happens to be very friendly on the pocket. It features a steel cooking grate, a handy tuck and carry lid, a steel charcoal grate for aeration and a briquette measuring cup so you don’t over do it on the heat production. If you’re a fan of the traditional smokey flavour and need a BBQ large enough to feed a group of you, the Weber Smokey Joe is the perfect choice. The best portable barbeque you can buy, bar none. Anyone who enjoys the sociability of tabletop cooking (think raclette) will love the idea of this BBQ from Berghoff. Thanks to its clever, heat resistant base, it’s safe to place on a table, so everyone can partake in cooking the food, rather than the dedicated BBQ chef missing out on the sociability of the event. The BBQ compacts down into one small unit and can be conveniently carried over the shoulder, making it perfect for beach trips, too, and also our pick of the best portable BBQ for social gatherings. Perfect for small gardens, this cast iron BBQ will look great as a garden feature. Made from cast iron, it’s designed for the outdoors, with natural weathering enhancing its rustic nature. There’s plenty of space to cook with and you can adjust the height of the grill to ensure you cook away from the coals. The BBQ is lightweight, so it’s still perfectly portable and with large wooden handles, carrying it to your designated cooking spot shouldn’t be a problem. There’s nothing more annoying than the sting of smoke in the eye but with this best portable BBQ grill from Lotus, that is no longer a problem. This BBQ boasts heaps of clever features that make it well worth the expenditure. From the battery powered fan that brings the heat up to the right temperature to the smoke free cooking that still infuses your food with that authentic smokey flavour, the Lotus Grill is a lightweight, colourful construction that’ll make back garden BBQs and beach trips a joy. It may be expensive but if you’re looking for convenient cooking, this BBQ from Weber may be just the ticket. Thanks to its built in carry handles, the BBQ is easy to transport, while the fold away cooking tables provide you with some handy prep space. With a control burner valve and thermostat, you can regulate the temperature of the BBQ so the food doesn’t burn on the outside and remain raw in the middle. You also have the option of buying a compatible BBQ stand, making this the best portable BBQ for home and away. If you’re looking for cheap and cheerful, it doesn’t get much better than the Hotspot Notebook Portable BBQ. It collapses into a flat shape and features carry handles for portability. There’s a charcoal grill and a cooking grill, which provide vital aeration and cooking space. Made from a heat resistant pressed steel and weighing in at just over 4.5kg, this is a lightweight, stylish BBQ perfect for trips away and as a stylish back garden feature. The best portable barbeque for those on a budget, we think. 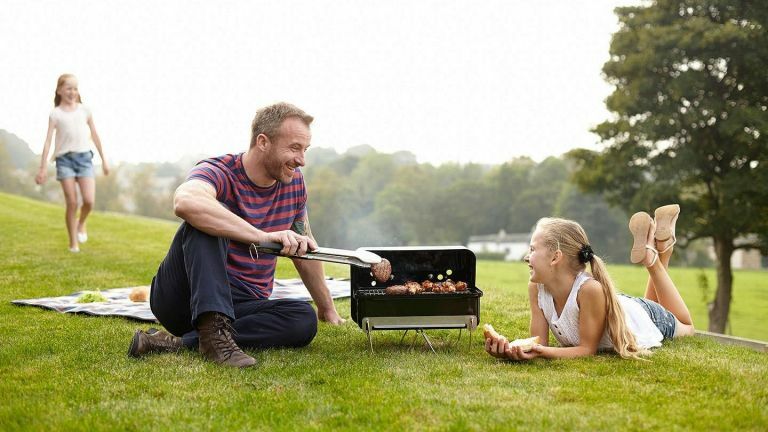 As with all cooking gadgets designed by Heston Blumenthal, this BBQ has been cleverly thought out to provide you with every feature you could possibly need, whether you’ve got people round for the evening or you’re heading out on your next camping trip. Similarly to the Berghoff, this is perfect for tabletop cooking, which makes your gathering all the more sociable. There’s the added bonus of a food grade plastic tray, which can be a handy storage area for either food or cutlery and napkins, and a bamboo tray for prepping. If you like the idea of a tabletop BBQ but find gas easier to handle, the solution lies with this best portable BBQ from Calor. With enough space to fit a 400g gas canister, you won’t need to worry about refilling too often, while the grill provides you with plenty of space to cook up a storm. To make cooking in the great outdoors even easier, the BBQ features a wooden lid that doubles up as a chopping board and shoulder straps for easy transportation. Almost as though you’re carrying a tool box, when it comes to transporting your BBQ to your favourite picnic spot, this one is a top choice. There’s plenty of space for cooking, and with two air vents you can carefully control the temperature and infuse your food with that great smoky flavour. With plenty of five star reviews, if you’re looking for a quality BBQ that makes a great all rounder, this is the best portable barbeque for you.